Happy Macaron Monday! Today I wanted to share my take on oreo macarons. 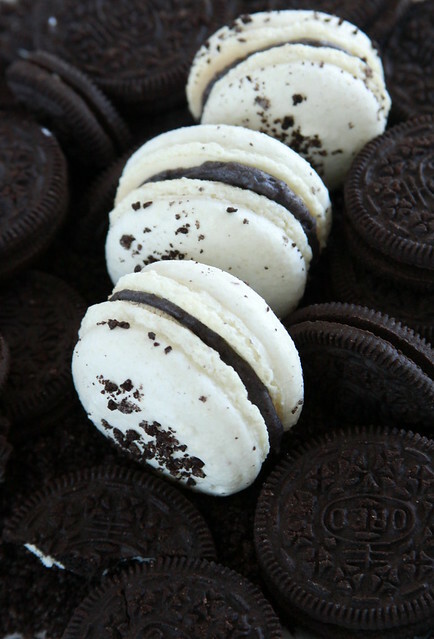 There are many oreo macarons out there. 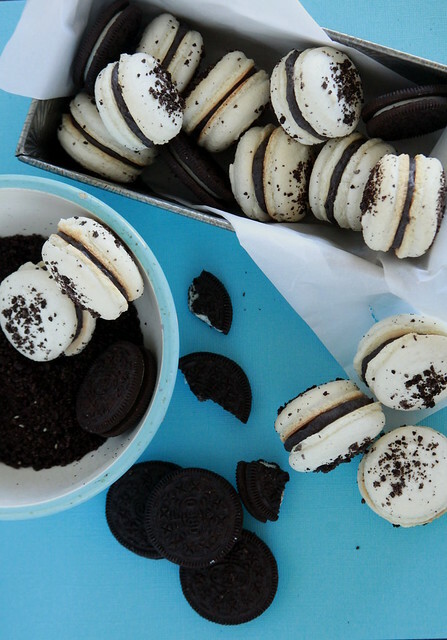 Many recipes fall into two fields: one with oreo crumbs in the macaron shell or ones without the oreo crumbs. I’ve tried both ways and I ended up liking the plain old french macaron shell. The flavor of the oreo crumbs is overpowered by the almond flour and the crumbs turn the macarons with potentially lumpy shells. 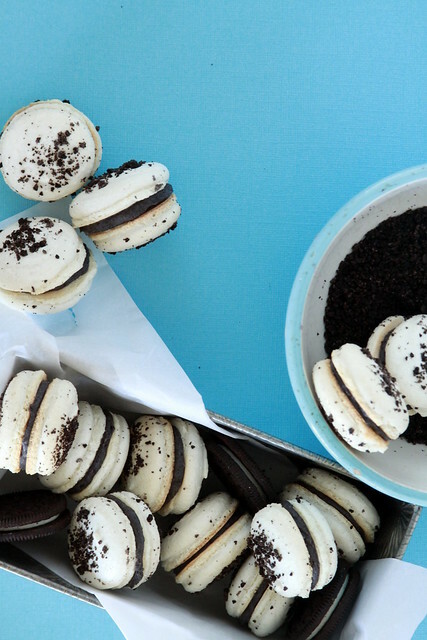 There’s nothing wrong with grey macarons. For cookies and cream, a grey shell could work. 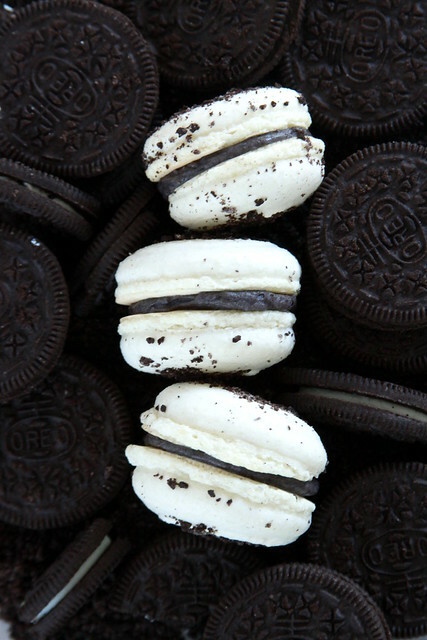 However when I think of an oreo macaron, I think of the bright sharp contrast between the bright white frosting and the dark cookies. I wanted to play off of the stark black and white contrast. In my previous french macaron post, I used Bouchon Bakery’s recipe for French macarons. Though it is a lovely recipe, I think I found a different go-to recipe. This versatile recipe from Les Petite Macarons is a no fail recipe and I’ve used it 5 times (and counting). I stuck to the Italian meringue method and it yields the most consistent macarons and decreases the chances for missteps in technique. I garnished the white shells of the oreo macarons with finely ground oreo crumbs. The dark cookie shines in the filling. To prevent the macaron from being too sweet, I opted for a cream cheese based filling. I hate dragging out equipment but sadly a food processor is needed. Having evenly ground crumbs makes for easier piping (big crumbs with clog the piping tip) and even consistency (macarons are about even consistency). I know traditionalist will say that food dye should be used minimally but I used gel dye in the shells and in the oreo macaron filling. 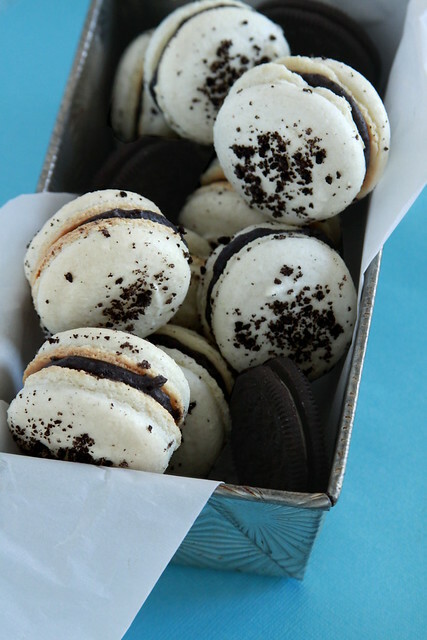 These inside-out oreo macarons are a great French take on a classic American sandwich cookie! In a food processor combine the almond flour, powdered sugar, and salt and pulse for 4 to 8 seconds for 3 times. To ensure consistent texture, scrape down the sides and bottom of the food processor's bowl. Sift these dry ingredients TWICE into a large bowl. Set aside. Beat the cream cheese and butter on a medium-high speed until light and fluffy, about 3 to 4 minutes. Add the vanilla and salt. Scrape down the sides of the bowl. On the lowest speed slowly add the powdered sugar. Scrape down the bowl again and then add the oreo crumbs and black gel. Once the macaron shells are completely cooled, sandwich the shells with the filling. The macarons should 'marinate' with the filling overnight before eating. It texture of the macaron will change and the shell and filling flavors will blend together better.